Almost all dogs are crated for one reason or another at some time in their lives. Either at the vets, in kennels, at a hotel when on holiday or for traveling by air. So whether you plan to regularly use a crate at home or not, many of the benefits of crate training a dog or puppy still apply. Dog crates are such an incredibly useful tool to use in management, training and as a safety device for your dog that I strongly recommend you do use one and crate train your Golden Retriever properly to accept and even love their crate. The following article discusses the many benefits both you and your Golden can enjoy by the use of a crate. Puppy’s are born with a strong denning instinct inherited from their distant ancestors to keep the place in which they den, the place they eat and sleep while a puppy, clean of urine and feces. A crafty puppy owner can use this knowledge to massively decrease the amount of time required to house break a puppy and avoid many of the little accidents they have to clean up in the process. When you place your puppy in the crate, they will refrain from going to toilet there as long as they possibly can. So you can crate them for short periods and as soon as you take them out, take them to their toilet area, encourage them to go and they will be ready and willing to do so. So instead of being free to roam your home and going to toilet wherever they wish, they hold off from going to toilet while in the crate and with your guidance go to toilet more often in the correct place outside. Overall this avoids most little accidents in the home and your puppy learns where the correct toilet area is much more quickly. 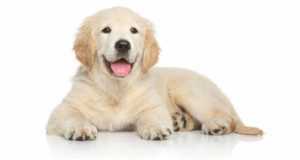 Golden Retrievers chew as puppy’s, as adolescents and most as adults too! 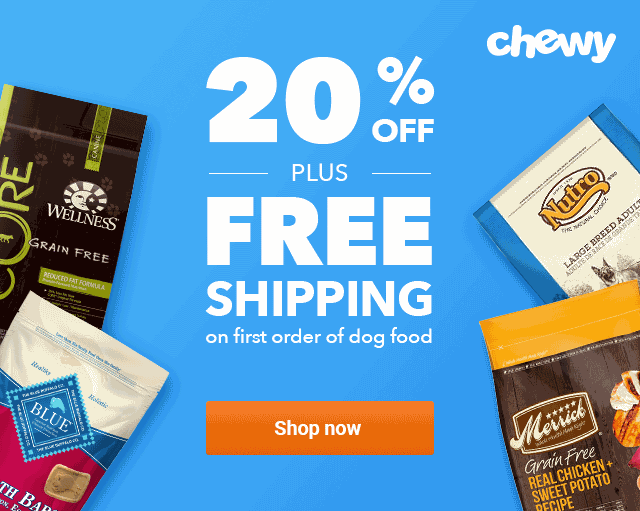 It’s a common trait for the breed that comes from their working retriever genes and you will not be able to prevent it. So to save your house and belongings, you need to teach them what they can and can’t chew and an important part of this is preventing bad habits from forming. Whatever your Golden is regularly able to and allowed to chew on is what they will become fixated on and chew as a habit. So if your Golden is able to regularly chew slippers, shoes and cushions, they may form this as a habit and habits are very hard to break. It prevents them from being able to chew the wrong things and so prevents bad habits forming. They spend much more time chewing on the correct toys you do want them to chew on and they form strong habits and addictions to these. The result? Less or no chewing on the things they shouldn’t and an addiction to chewing on the things that they should. If you cannot supervise your puppy or dog there is so much opportunity for them to get into mischief. And mischief could mean some expensive damage to your belongings, or putting themselves into a dangerous situation. Every year thousands upon thousands of dogs need medical treatment for eating poisonous substances, chewing electrical wiring or swallowing man-made objects. If you cannot supervise them and jump in if they start to get into trouble, you can prevent these things happening by crating them a short while. Dogs are reward seekers. They will perform many different behaviors until they find one that ends in some form of reward. They will then repeat that behavior in future to try and get that reward again and again. This is how habits are formed. Habits that we generally come to call behavior problems. This could be digging in your yard, chasing the cat or getting into the fridge and eating the contents. All rewarding behaviors for a dog but that we do not want to see. But if you’re there to catch the behavior when it happens, intervene, correct them and show an alternative behavior, they don’t get to the reward and the bad behavior doesn’t get positively reinforced and form into a habit. What happens when you’re not there to intervene though? Well, they could be performing all sorts of behaviors that they find rewarding and many bad habits could be formed, all without you ever having seen. And once the habit is formed, corrective training can sometimes be very difficult. So again, crating your Golden when you cannot be at hand to intervene and re-direct unwanted behaviors prevents bad habits from forming. 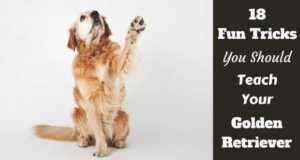 This will help hugely with your Golden growing into a well-behaved adult dog with only good habits formed. And once maturity sets in at 18 months to 2 years of age, you can start to trust them more and more, and crate them less and less (if at all) because they have no bad habits and can be trusted to behave. A well-behaved dog is less stress for you, and less stress for your dog who rarely find themselves in situations where they need to be told off. One of the major benefits of crate training a dog is they learn to see it as their own special little place where they can go to feel safe and secure. Many dogs in modern life find it very hard to get away from things, with busy households, kids running around and most likely other pets. With a crate, they have a place that’s just their own that offers them a refuge to find peace, quiet, down time and a feeling of security when they want to get away to relax and sleep. Long after a crate’s no longer needed for management purposes (after adolescence usually) dogs will still use their crate as their own little den and often they will crave and miss it if you take it away, such is the love they develop for it. There’s usually a two-prong approach to solving any behavior problems that do develop, training and management. The training part is where you actively work on teaching a new behavior in place of the problem behavior you’d like to stop. The management part is your attempts to prevent your dog having the opportunity to perform the problem behaviors at all. This combination of preventing your dog performing the behavior and getting away with it, as well as training a new one gradually cures the behavior problem. So how do you reliably perform the management part? 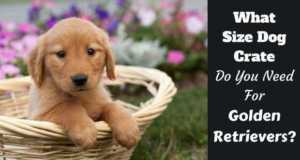 You intervene and re-direct when you are with your dog, and you crate them when the behavior cannot be avoided. An example would be if your dog is aggressive towards men. An extreme example maybe, but if they are, you would embark on a carefully planned course of socialization. But what if a male friend comes to visit unexpectedly? You can’t always use this as a training experience. So you might crate your dog temporarily to prevent them getting aggressive toward the man, possibly reinforcing the behavior and undoing all your socialization work. A crate is a useful tool for time outs if you ever need to take your puppy out of an environment to calm them down when over-excited and cannot be controlled. This often happens when they’ve been playing with another dog or puppy, young children, or even a vigorous game of tug with yourself. A puppy can often become so aroused and over-excited that it’s very hard if not impossible to calm them down again. Sometimes a time out is the only option. So you can place them in a crate for a couple of minutes until they’ve calmed themselves down and can then be let back out. 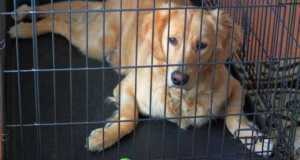 Crate training your Golden Retriever will make them far more accepting of being crated to travel by car or plane. For air travel, being crated is unavoidable and if they’re already used to it they’ll be far calmer and the whole ordeal is far less distressing. An unrestrained dog in a car can climb about and distract a driver which is the cause of many accidents every year. In the event of an accident, an unrestrained dog the size of a Golden Retriever flying forward through the car can cause severe injury to other passengers. In the event of an accident, an unrestrained dog often becomes dazed and confused and is able to run free of the car if the windows are damaged. It’s not uncommon for them to wander into traffic in this situation. For some dogs, the noise, sights and smells of a car journey is overwhelming and very stressful. If they’re crate trained and placed in a crate with a comforting blanket and their favorite toys, they will be far happier. So crating your dog when driving reduces stress and keeps them and all passengers safer in an accident. And training them to be happy in a crate before they ever have to travel ensures they’ll be happy crated in a car or plane when the time does eventually come. If your Golden ever has to be boarded when at the vets, or if you travel without them and a family member can’t watch them, the experience will be so much easier if they’re already used to and happy being crated. Being in a new environment and away from their family is stressful enough, being crated for the first time on top of this can make it worse. And if at the vet it’s because they’re ill or injured as well! Crate training your Golden will at least make these experiences as easy on them as possible. 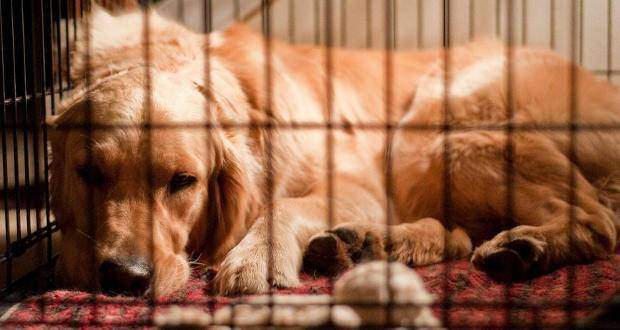 Crate training could be one of the best things you can do for your dog. The benefits are many and plenty. House training is quicker and it protects your belongings from destructive chewing. It gives your dog a place of their own to escape to for peace, quiet, comfort and security. It makes travelling easier and safer, helps prevent bad habits and is used as a management tool when correcting already formed behavior problems. These are just a few of the benefits you and your dog can enjoy. But perhaps one of the most important ones not mentioned? If your dog develops less bad habits, spends less time chewing things it shouldn’t and a crate keeps them safe and out of trouble when you cannot supervise them…you in turn have less need to tell them off and correct bad behavior. This means a happier and more loving environment for both you and your dog and a healthier, stronger bond between you. Now THAT’S a massive win for all involved! Next: Is Crate Training Cruel?